Hello Again! It’s Almost The Start of Another Season at Parlee Farms! June is here which means that it’s almost time for Parlee Farms to open for their 27th season of growing! We are currently looking at a mid-June opening date. The start of the strawberry picking season has been slightly delayed by the cool spring that we had here in New England. Great spring growing conditions for strawberries are days that are sunny, warm, and not too wet. The good news is that the strawberry plants came through the winter well. The heavy snow cover acted as a blanket and as a result, there was no winter injury to the plants or buds. Jewel strawberries make up the majority of our strawberry plantings. They are high-quality strawberries that are known for their excellent flavor. They are large and firm and have abrasion-resistant skin which makes them great for pick-your-own. They stay healthy longer than other varieties. Jewel is one of the best varieties for pick your own strawberries! Mayflower strawberries are new to Parlee Farms this year. These strawberries are large and firm and good for freezing. Valley Sunset strawberries are another new variety at the farm this year. A late-season strawberry, the berries are a lighter red, shiny, and on the larger side. It has a softer skin than other varieties, which makes it better suited to the local market. 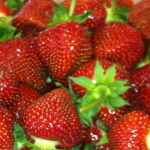 The Cavendish strawberry is an old favorite at Parlee Farms. Cavendish strawberries are large, firm, and bright red. They are excellent for freezing. This is a popular pick-your-own strawberry that is also commonly grown in home gardens. Another old favorite, the All-Star strawberry has a perfect strawberry shape and a sweet flavor that make them perfect for fresh eating. 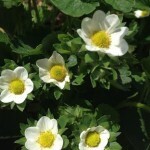 From the time of blossom, it is about 4 weeks until the strawberries are ready for harvesting. Here at Parlee Farms we had our first blossoms around May 18th. So it won’t be long until strawberry picking begins. We are looking forward to seeing you “down on the farm” once again!